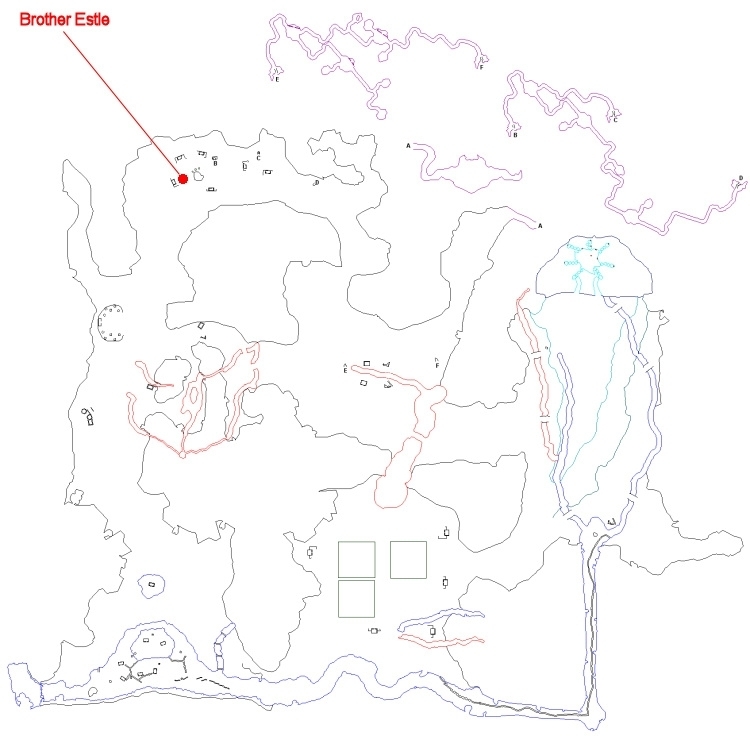 This is a heroic adventure (1-6 players) that begins with Brother Estle (click for map image) in the Ethernere Tainted West Karana. He is located in the northwestern part of the zone, just southwest of the floating village (/location 265, -280, -91). - Say "help" to request the task and "go" to zone in. --- Five smoke auras spawn around the village (findable via CTRL+F); step into the auras to spawn 1-3 ambush mobs. --- Hail Guide Jornlin; follow her into tunnels to auras; step into the auras to spawn ambush mobs (1st = 2; 2nd = 3; 3rd = Guide Jornlin KOS). --- Hail villagers until you get an update. --- Destroy the "Bandit Wall" near /loc 280, -2075, -100 (2x "a wall defender" spawn every 25 seconds; despawn after wall is destroyed; hail "a frightened bandit". Brother Chintle was last seen entering the bandit camp to the east of the village. After sleeping until nightfall, you can sneak into the bandit camp and look for clues to Brother Chintle's whereabouts. Perhaps the bandits keep a logbook lying around that details the events that happen in their camp. --- Head to the bandit area around /loc 280, -2075, -100 and find "Bandit's Log" on the ground at about 615, -1735, -100. --- In the bandit area, DPS "Ladric the Fancy" (spawns an add at 70%, 40%, and 20% health); task updates at 10% health. --- Hail update (Brother Estle is now closer to the bandit camp). --- Mobs called "a burrow" spawn around the village and make their way towards "a box of knives" in different locations (16 total); attack "a burrow" to spawn "a bandit burrower" (if "a burrow" reaches "a box of knives", the bandit burrower spawns on its own, but has the ability "Knifeplay"). --- Kill update (10x "a bandit bear rider"). --- Kill 6x "a bandit tailor" (each can cast "Fine Linen Wrap"). --- Find Ladric in the tunnels beneath the bandit area (you'll also have up to 4x "a hovering junkpile" assisting Ladric). Step #11 is done, the task completes. He also has a chance to drop Rk. II spells and armor pieces. You have been assigned the task 'Remember the Dead'. In this brief respite between attacks from spirits and the Harrowing Horde, Brother Estle wants you to find Brother Chintle and bring him back. This missing brother must know something about the recent attacks and plans of the Horde. You have entered Ethernere Tainted West Karana. Task Window Says: Now that the Harrowing Horde has slackened their attacks against the village, speak with Brother Estle about the whereabouts of Brother Chintle. If You Get This Step: Hail update. Task Window Says: Brother Estle said you should ask people in the village whether they have seen Brother Chintle recently. If You Get This Step: Hail updates. Task Window Says: The villagers have given you clues about various places Brother Chintle could be. You should investigate the locations of various sightings. If You Get This Step: Around the village are five smoke auras spawn (findable via CTRL+F). Step into an aura to spawn 1-3 ambush mobs (hit for a max ~6,000). Stepping into the auras and mob kills contribute to this update. Task Window Says: Someone has come forward and claims to have recently seen Brother Chintle. Speak with them and find out where he has gone. If You Get This Step: Hail Guide Jornlin and follow her into the tunnels. In the tunnels will be three auras. Step into an aura to spawn an ambush of mobs. The first aura spawns two mobs; the second aura spawns three mobs. These mobs hit for a max ~6,500 and are rootable/snareable, but summon. In the last aura, Guide Jornlin aggro's and must be killed. Task Window Says: The spirits of the dead have confounded your efforts to find Brother Chintle. Tell Brother Estle of your failure. Task Window Says: Speak with the person who just saw Brother Chintle. If You Get This Step: Hail villagers until you get an update. Task Window Says: Brother Chintle was last seen entering the bandit camp to the east of the village. The bandits have erected a high wall to keep out invaders. You will need to destroy the wall to get inside. Interrogate any frightened bandits you find. If You Get This Step: Destroy the "Bandit Wall" near /loc 280, -2075, -100. Note that for purposes of DPS, this is an invisible man in the front/center of the wall, with a small hitbox. Upon attacking it (and every 25 seconds thereafter), 1x "a wall defender" spawn and attack. These mobs hit for a max ~4,000 and have a relatively small amount of hitpoints. 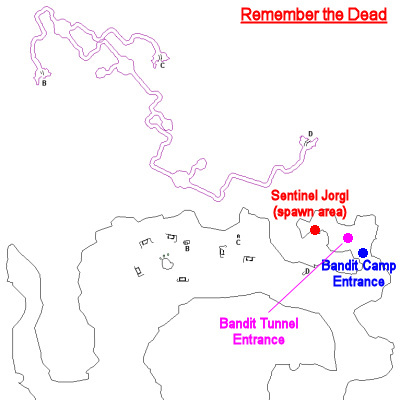 Once the wall is killed, head to the end of the bandit camp where you'll find "a frightened bandit". Hail it to update the step. If You Get This Step: Head to the bandit area around /loc 280, -2075, -100 and find "Bandit's Log", a ground spawn at about 615, -1735, -100, give the logbook to Brother Estle. If You Get This Step: In the bandit area, DPS "Ladric the Fancy" (spawns an add at 70%, 40%, and 20% health); task updates at 10% health. If You Get This Step: Hail update (Brother Estle is now closer to the bandit camp). Task Window Says: Bandit burrowers have appeared all over the village. They are digging close to the surface and are heading for the crates that sit around the village homes. Kill the burrowers before they get to the knife crates and become more powerful. If You Get This Step: Mobs called "a burrow" spawn around the village and make their way towards "a box of knives" in different locations (16 total). If you attack "a burrow", it triggers the spawn of "a bandit burrower" (kill target for this step). If "a burrow" reaches "a box of knives", the bandit burrower spawns on its own, but gains the ability "Knifeplay" to use in combat. If You Get This Step: Kill update (10x "a bandit bear rider" that spawn around the village). Task Window Says: Speak with Brother Estle about what to do next. Task Window Says: Kill Ladric the Fancy's tailors in order to drive him out of the area. The tailors are hiding in the tunnels beneath the bandit camp. If You Get This Step: Kill 6x "a bandit tailor", each of which casts "Fine Linen Wrap" every 35 seconds (random target). If You Get This Step: Find Ladric in the tunnels beneath the bandit area at around 555, -1855, -93. Also in the tunnels is an NPC named "Gormley" who spawns mobs called "a hovering junkpile" that assist Ladric (you'll have up to four of them to contend with). Adds despawn upon Ladric's death; Gormely is an optional kill. Task Window Says: Speak with Brother Estle and tell him you have eliminated the bandit threat. If You Get This Step: Hail update to complete. You have discovered where Brother Chintle might have went. You should leave and prepare for another search. Task Window Says: Brother Chintle was last seen entering the bandit camp to the east of the village. The bandit leader, Ladric the Fancy, might know more about Brother Chintle's whereabouts. Rough him up and convince him to talk to you. Task Window Says: Bandit bear riders are wandering around the village, seeking retribution on villagers for the invasion of the bandit camp. Weaken them, and they'll be knocked off their mounts, decreasing their attack power. When looking for the Bandit Bear Riders, I ran out of mobs when just running around the village. I eventually found several more when I moved towards the new / updated location for Brother Estle. Tried to split by mezzing/fading and got summoned and killed off the bat. Summon at 100% is so not right. Some of us believe summoning is a highly overused mechanic in this game period. Sorry to hear you got to eat a death finding out this NPCs habits. 24 aa's earned by group of 105's with LotD running. Alas, double-XP weekend had ended. When you ask the villagers questions (=Hail them) don't forget those at the top of the transparent ramp. Nothing sees thru regular invis. took my 100 wizard in to do this a few times. Need Jorgl for hunter. so far 8 missions - no name. step 1 and 2 always the same. *Task Window Say : Someone has come forward and claims to have recently seen Brother Chintle. Speak with them and find out where he has gone. info - the ambushers are white and yellow con to a level 100, are snarable and rootable, but all summon. they only hit me for max 3600. Jornlin was also snarable and rootable and did not summon, but hit for 5k. If you get the other one, the auras spawn mobs and auto agro but they are snarable, rootable and don't summon. Ladric the Fancy's health locked at 10% on us tonight. We had the 4 junkpiles mezed so thought that perhaps the quest had changed since the last time we had done this quest several weeks ago so we started killing the adds. Gormely comes running around the corner popping a replacement junkpile every time we killed one of the originals so we simply succored out to try again thinking perhaps the 10% health lock was just a fluke. We ran back. Landric's health was at 100% with the original 4 junkpiles there and Gormely where he was supposed to be. Tried again and still the health locked at 10%. Anyone else had this problem? Picked up ~2% reg exp and 92 marks @ level 85. Say Help to get task, say Go to enter. Just happened to me.. talk about 1 hour for nothing.. I got 3 updates for each spot I visited, so only had to visit 4. Not sure if it's based on number of characters in group or what. I did have 3 characters and 3 mercs in the group. I got two pops at each of the spots. Ladric the Fancy has like 4 adds...just jump in Tank Merc handled just fine.